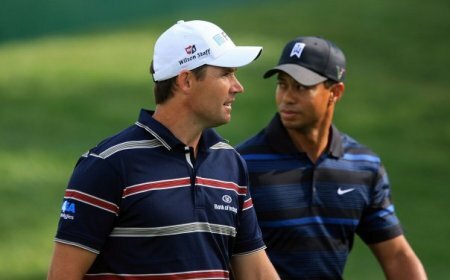 Tiger Woods sympathises with Padraig Harrington as he changes his swing in the public spotlight. A terrible beautyThe world No 1 knows how it feels to have his swing dissected by the fans having done it several times himself during his amazing career. But he's convinced that the Dubliner is just trying to get to the next level and urged him to believe in himself. Woods said: "We're all trying to get better, we're all making changes. The game is fluid, it's always evolving. You're always trying to make adjustments here and there to try to get yourself to the next level. I think that's what Paddy has done. "The hard part is doing it in front of everyone. Sometimes it can be a little difficult because you get questioned quite a bit. But you have to understand the big picture for yourself." The pair played together in last month's US Open, where Harrington crashed out at halfway after a nightmare week with the driver. Had it not been for his short game, the Dubliner would have finished even further behind the world No 1. Woods said: "We didn't really talk a whole lot while we were playing He was struggling a little bit, but grinded pretty hard and the second day getting up and down from where he was was pretty phenomenal." 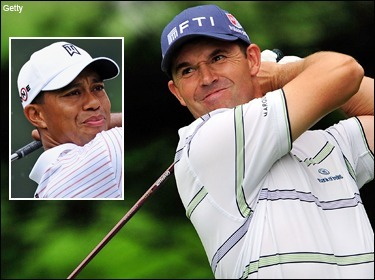 Padraig Harrington is not Tiger Woods. When it comes to telling his wife lies, the Dubliner reckons he’s a 24 handicapper. So what do you make of Tiger’s double life, Padraig? “Triple-life,” Harrington corrects. “Golf, home and when he was away. Imagine trying to manage that!